When journalists in Kazakhstan face off against powerful corporate interests, it rarely ends well for the small guy. For that reason, media rights advocates are watching with interest as one reporter in the industrial town of Temirtau dukes it out with an industrial behemoth that ranks among the country’s largest investors. Earlier this month, on October 18, the pendulum appeared to swing in favor of Oleg Gusev, when police revealed that they had opened a criminal case against Galymzhan Kunakbayev, a senior executive at ArcelorMittal Temirtau, on suspicion of unlawfully obstructing a journalist’s professional activities. The venue for this drama is particularly striking. Temirtau, an industrial town that is home to some 210,000 people, was where 78-year-old President Nursultan Nazarbayev began his career as a metalworker. Gusev, who has worked for several publications including business weekly Expert, local newspaper Temirtausky Rabochy and business TV channel Atameken, has long been a thorn in ArcelorMittal Temirtau’s side. His reporting on the coal-mining and iron-manufacturing giant has dwelled in part on the company’s alleged violation of technical requirements and safety regulations. These have led to the despoiling of the local environment, Gusev has claimed. ArcelorMittal Temirtau has in the past batted away accusations that its activities have caused unsustainable levels of pollution. In January, for example, the company was criticized when the snow in Temirtau turned black. The company protested that it was not the only local source of pollution; it pointed to the growing number of cars in the town and said dirty particles were also pumped out by household heating systems. In allegations detailed on Facebook, Gusev has claimed that ArcelorMittal Temirtau earlier this year demanded a halt to his critical coverage. Gusev says ArcelorMittal Temirtau then followed up by offering an advertising deal in exchange for his employer putting a stop to the articles. Citing the sensitivity of the allegation, the journalist declined to divulge to Eurasianet which among the outlets where he works received this offer. ArcelorMittal Temirtau’s patience seems to have snapped in May, and for the most curious of reasons. That month, Gusev posted side-by-side photos on Facebook of Austrian drag queen performer Conchita Wurst and ArcelorMittal Temirtau general director Paramjit Kahlon, commenting on a purported physical similarity between the two. At that, the company filed suit against the reporter, citing damages to its business reputation. Gusev claims that the company sensed this lawsuit would go nowhere and opted instead for hardball tactics. He laid out this next claim in a public appeal to the police in a Facebook post published on October 18. Police opened their criminal case a few hours after the post was put online. As a result of that pressure, Gusev alleges that he and the company hatched some kind of written agreement – a document that has now been forwarded to the police as evidence of purported blackmail. Were Kunakbayev found by a court to have used intimidation to silence the journalist, he could face up to two years in prison. Agoureev, the ArcelorMittal Temirtau spokesman, also declined to comment on this police investigation. “A legal evaluation of this situation will be given in court. Let us wait for their decision,” Agoureev told Eurasianet by telephone. Olga Didenko, a lawyer at Internews Kazakhstan, told Eurasianet that were Gusev’s case to make headway, it would mark a critical precedent for the country’s independent journalists, who routinely face intimidation from businesspeople and officials in the form of financially crippling lawsuits. The momentum is on the reporter’s side so far. The case had been passed on to a higher authority, the Karaganda regional police department, which suggests at first glance that the investigation has legs. “This case with [ArcelorMittal Temirtau], if it goes to court, will be great news for journalists, since it will be a precedent that will help Kazakh journalists in future,” she said. “But unfortunately, we have other examples of cases that have been downgraded or closed." According to data from the General Prosecutor's Office, police have over the past three years registered more than 10 cases of “obstruction of the lawful professional activities of journalists.” All have been discontinued for various reasons. “It always gets away with it,” he said. When Temirtau’s snow began to turn black in January, an activist called Stanislav Voitsekhovsky created a series of videos claiming to document how the miner may have been responsible. 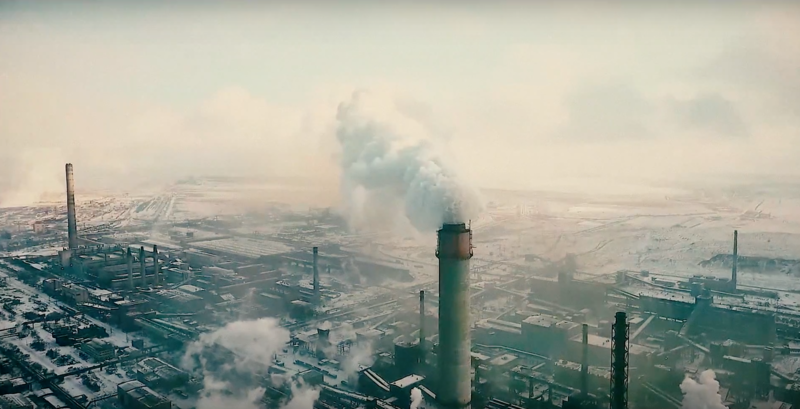 In one video, created with a drone, he featured aerial shots documenting the state of disrepair at an ArcelorMittal Temirtau power plant. But after he was slapped with a lawsuit, Voitsekhovsky was compelled to issue a public apology. The videos are no longer available on his channel. Another YouTube user, Zhanibek Zhanabayev, has uploaded similar footage showing the sheer volume of acrid smoke pumped into Temirtau’s skies by ArcelorMittal Temirtau facilities. Dmitry Kalmykov, a representative of the Karaganda Ecological Museum, has told Eurasianet that when local authorities conduct their annual inspections of ArcelorMittal Temirtau plants, they are routinely fined for environmental violations. What is more, existing environmental regulations are outdated and not able to keep the miner to high standards, Kalmykov said. That notwithstanding, the company was in January fined 600 million tenge ($1.6 million) by Karaganda environmental officials following the black snow. ArcelorMittal Temirtau denied responsibility in defiance of expert evaluations.